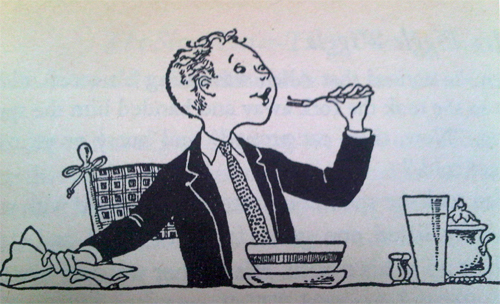 Now no one can say that you didn’t see a cartoon of an effeminate boy eating soup. Is that from or related to the Ms./Mrs. Piggle-wiggle books? It seems so familiar. And yes, I don't quite remember the title, but damned if I'm going to bother looking it up. Yeah, I know I've seen this before, years ago, but I can't remember where. Damn.